Ask fellow campers about "Kennebec KOA" and nearby attractions. Question: Regarding Kennebec KOA in Kennebec South Dakota, how is the WIFI?? Answer: It was ok, we were on the far end. We could check emails some websites etc. Not super fast but met our needs. I was able to find our next campground and make reservations. Great place for an overnight stay. There is just a gas station nearby, no restaurant, so I would not stay long term, but a great place when traveling through. The dog area is small and there is not a lot of spaces for walking. Make sure you have good provisions for the night as the closest store is 35 miles away. We camped at Kennebec KOA in a Motorhome. We stopped at this KOA for a night on our way to western SD. Nice staff, clean restroom/shower area, level gravel space. What more could you ask? Access road could get nasty after a rain though, it is quite long, bumpy, and looked like dried mud. Call staff for its condition if it has recently rained. We camped at Kennebec KOA in a Motorhome. Nice park easy to get to and far enough off the highway that it cannot be heard. The shows need a lot of work badly. We camped at Kennebec KOA in a Travel Trailer. Very little at this exit. We last stayed here 4 years ago. See that 8/14 review for a better description of the park. We picked this park because it fit our driving mileage/hours schedule from Sioux Falls. The park seems to have more FHU sites (almost 30) than it did 4 years ago. That made it easier to get a FHU with cable TV site that was also satellite friendly. The internet connection was a bit unreliable, so I did not try write this review there. The park has the usual (pool, playground, etc.) KOA amenities. The bath and laundry facilities were acceptable. I did not check for recycling. We camped at Kennebec KOA in a Motorhome. Yep, an overnight spot when you're traveling through South Dakota. That's about it. There were kids enjoying the pool and the Chuckwagon 'restaurant' was open. Camp store had alcohol, not much else. Looked like most of the spots were level, ours was mostly level, but had to dump uphill, so not a spot I'd choose again. Dog park was small, but the dogs loved being off leash after being cooped up all day. We camped at Kennebec KOA in a Fifth Wheel. make sure you have everything you need before getting there because there's nothing there! Actually a rather nice prairie type KOA with easy access and nice hosts. We only used it in transit so cannot in detail otherwise. We camped at Kennebec KOA in a Motorhome. Easy access from highway about half way across South Dakota. Fuel is easily available nearby. Great off the road stop. Sites are level. People our very friendly. Put us in a better site. Stayed 3 nights only cause I was tired of traveling. Not much to do there or around . Sewer smell at end of park. Does need some up dating around park. Would stay again. We camped at Kennebec KOA in a Travel Trailer. Great place to stop for a night when traveling across South Dakota. easy access from I-90. The Chuckwagon eatery mentioned in an earlier review is now closed. Although we didn't use, the pool looked very inviting. The sites on the west end are near a retention pond which had an odor when we were there. Probably only an issue if the park is full and those sites are in use. No odor in other sites. Basketball court and mini-golf are in disrepair. We would stay again. We camped at Kennebec KOA in a Motorhome. This KOA is good for what it was. A place off I-90 to spend a quick night in a pull through with full hookups to dump the tanks and get a very early start the next morning. The sites were dirt and mostly level (one block needed under left side tires) and had a dual sewer hookup (mid-rig and back bumper for wherever your's is located.) Each site had a metal picnic table. Since we we got there late and planned to leave early we didn't notice if a fire ring was available. The campground was less than half full and they stuck us between a large Class C and a VERY large Class A. It annoys me when they do this in an empty campground, but, I suppose they do it for easy maintenance. Power worked without problem, water had good pressure. Plenty of "grassy" areas to walk our two small dogs but they both ended with several burrs in on their legs that required cutting out later. I say "grassy" because it's mostly weeds in dried out dirt. That said, the campground was very clean and the folks who checked us in were VERY friendly. It was very windy during our stay but the documents provided at check-in even say "YES, IT'S THIS WINDY ALL THE TIME!" A little more expensive than several other KOA's we stayed in on our trip but a nice quiet place to spend the night. Overall, we were happy with our stay. We camped at Kennebec KOA in a Travel Trailer. This is the worst of the KOA campgrounds we've stayed at (and we have stayed at quite a few around the country). It was not well kept. It was very muddy and smelly. The worst feature was the rudeness of the people working there. It was convenient to the highway in a stretch where there aren't many options for RV's - that's about all it has going for it. We camped at Kennebec KOA in a Motorhome. This is an older KOA just off I-90. Access is good. Interior roads and pads are dirt. There are some small trees around RV sites and some larger trees by some tent sites. There are places to walk the dogs, but no off leash area. And, there are burrs that will get in your dog's feet. They admit it is always windy here, can get dusty. There are few campgrounds in mid SD, so this is a place to stay overnight, but not longer. Nothing in this town. Staff was friendly. We camped at Kennebec KOA in a Motorhome. This is a small KOA located very conveniently to I-90 in Kennebec, SD. The park has a very friendly staff and showed me a couple of "short cuts" in getting a big rig into a big rig site. The roads are a bit narrow but accommodated a 45 foot coach towing. The CG has a "Chuckwagon" restaurant, albeit we didn't use it. We would definitely stop here again if in the area. We camped at Kennebec KOA in a Motorhome. We made our reservation online and upon arrival were initially shocked that the park was totally empty, and at 12:30 in the afternoon the office was closed. They left a note on the door with our name & site number so we took a map from the after hours registration and parked ourselves. All I can say is, don't judge a book by its cover, because when we returned to the office to complete our registration we were served by the most courteous, knowledgeable and friendly staff; who just happened to be the owners! By the late afternoon the park was full! We really enjoyed our spacious site, and noticed that a lot of work is going into new improvements, such as the aluminum picnic tables at every site. We requested a level site long enough for our 42' Class A with toad having a clear view of the south sky for satellite and our request was granted. There was a nice pet walk area and plenty of room on the perimeter of the park to play and run with the dog. WiFi was excellent. We camped at Kennebec KOA in a Motorhome. This is a rural area with one gas station and one grocery. If staying awhile, bring your supplies and fuel up first. Very convenient to Badlands, easy access from I-90. We had reservations. Were told that there were no sites large enough for our 43 ft with toad, we also requested Satellite friendly. Arrived around 4 pm, at least 10 - 15 sites big enough for our RV with Toad but they "said" all sold out. Our site indicated that the park had some problems, the sewer had been recently dug up with a pile of mud all around it. Used every inch of 25' sewer hose. Satellite would not work because of tree right in the SW area. "Something" has happened at this park involving the sewer sites which they are not admitting. We left after 5PM and EVERY site previously opened was still opened. We camped at Kennebec KOA in a Motorhome. We last stayed here about 15 years ago before we developed a number of regular stops in central SD along I-90. The biggest surprise was checking in around 3 P.M. and finding ourselves being the only customers in the park. 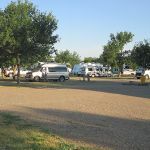 Half a dozen other RVs (including one fool in a big rig who pulled in about midnight) eventually came in to the park. Obviously, there are no extended stay customers. I think the one of the things hurting their business is the lack of a "draw". 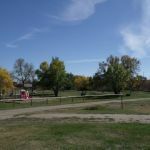 Unlike RV parks miles to the east and west of Kennebec, there is no Cow Palace, or 1880s Town, or Lewis' and Clark's Missouri River crossing nearby. We had a level, gravel, full hookup site with 32 channel cable TV. The site was also satellite friendly which many sites are not. By my count, there are 17 FHU with cable, 6 W&E with cable, and 22 W&E without cable. The rest of the sites are for tents. There is a playground, a nice looking pool and hot tub, and a game room on the second floor of the office. The air temperature was too cool for us old fools to use the pool. Typical of older KOAs, the bathrooms and laundry were old, but clean and functional. The food service was already over for the season. I can't remember if there was any recycling. The owners were very friendly. I'd stay here again if it fit my travel agenda. We camped at Kennebec KOA in a Motorhome. 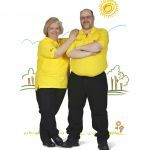 Are you affiliated with Kennebec KOA ?